From left, Irving Roberts, won the 2018 Bob Hudson Small Business Person of the Year Award. Joining him for the ceremony Chamber President Joe Pickens, Lucy Hudson and Dr. Anand Kuruvilla, last year’s winner. Photos by Mary Makie Connor Saucier. 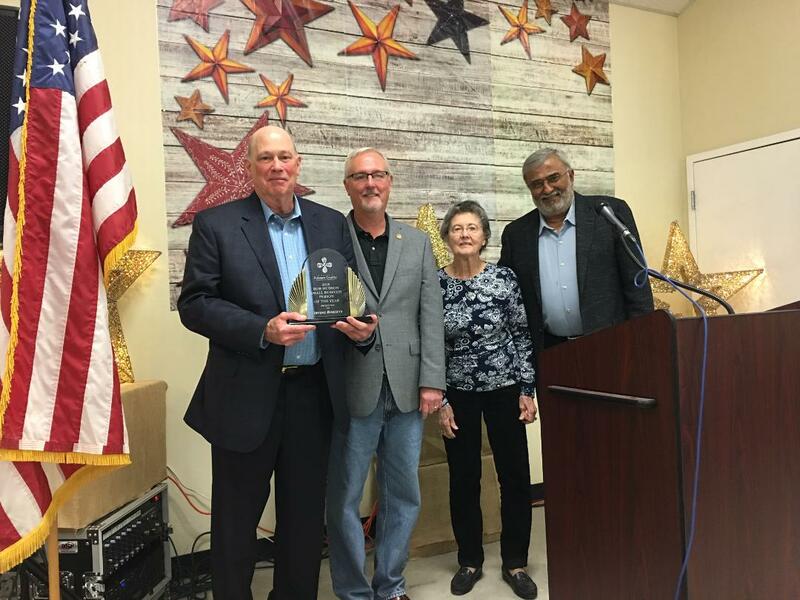 PALATKA – Putnam County residents turned out Saturday (Feb. 2) to the Putnam County Fairgrounds to honor outstanding residents, enjoy oysters, shrimp and prime rib and wait for a pony named Boo as the Putnam County Chamber of Commerce held its 84th annual meeting. Incoming Chamber Chair Steve Overturf (right) was given the Chairman’s Plaque by outgoing Chamber Chair Joe Pickens. Pickens also passed along the $1 and $100 bills to Overturf. “Passing the buck” is a long-standing tradition at the Chamber’s annual meeting. Irving Roberts, a Putnam County native, won the Bob Hudson Small Business Person of the Year Award. The award is named for a man who was not only a successful business owner but someone who always was willing to help the community. His widow, Lucy Hudson, was at the ceremony as Roberts was honored. Roberts has longtime roots in the community including having been valedictorian of Palatka High School’s Class of 1970. These days he and sons operate Roberts Land and Timber Company, Roberts Ranch and ANU Managements, which owns and develops commercial retain shopping centers across north central Florida. 2018 Wes Larson Living Legacy Award, Rusty Starr, former PDN publisher and a former Chamber president and treasurer. Also honored for their contributions to the Chamber and community was the folks who help make the large bass tournaments held in Putnam County work. They’re the people who get to the riverfront at 2 a.m. to assist anglers with parking. They’ll be busy this week (Feb. 7-10) at the B.A.S.S. Bassmasters Tournament in Palatka. Those early-getter-uppers: Greg Bacon, Corey Booth, Sheriff Gator DeLoach, Taylor Douglas, Derek Hembree, Donna Duty, Ed Killebrew, Chris Leduc, Wayne McClain, Steve Overturf, Ryan Overturf, Brent Overturf, State Rep. Bobby Payne, Walton Pellicer, Mike Perry, Bill Pickens, Terry Suggs and Joe Wells. Incoming Chamber Chair Steve Overturf, Johnson-Overturf Funeral Home, took over the reins from outgoing Chair Joe Pickens, president of St. Johns River State College. Overturf presented a couple of gifts to Pickens including Angel Soft bath tissue and Sparkle paper towels, two products made at the local Georgia-Pacific plant. Pickens likes to cook so he was also presented with a set of salt and pepper shakers hand carved by Skip Lagassee from a cherry tree that came down in East Palatka during a storm. “Also made right here,” noted Overturf. Overturf introduced the 2019 Chair Elect for the board – Charlie Douglas of Douglas Law Firm. And about that pony. The white Shetland goes by the name of Boo and was the main attraction for Pony Plop Bingo. That’s bingo where the pony’s plops on a “card” drawn in the pasture determine who gets to yell bingo and win cash. Judges for the event included City Shippers’ Greg Bacon, former Putnam Sheriff Taylor Douglas and Putnam County Commissioner Larry Harvey. “We’re waiting for Boo to poo,” as Douglas explained. Several winners declared this year.